The pursuit of positive change always begins with one thing – a step forward. 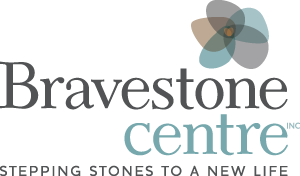 Inspired by the courageous steps taken by the many women and their children that we have served since 1986, our organization changed our name to Bravestone Centre Inc. from WISH Inc. (Women in Second Stage Housing) as of June 2014. Our commitment to providing women and their children a safe home remains the same as does our extensive counselling and support in helping these families build a better life free from violence. What is unique and new is the expansion of our family services, including a focus on strengthening the healthy attachment of moms and their children while providing greater opportunities to enhance parenting skills. We truly believe that helping children and youth early prevents the cycle of abuse from further impacting their lives, both in the present as children and lays the foundation for a healthy and thriving adulthood. For women trying to escape from an abusive relationship, Bravestone Centre can help. Being brave doesn’t necessarily mean you’re not scared. Being brave means you are scared, but you are taking the first steps anyways. We can help women and their children create a foundation in which to begin a new life, free from abuse. Bravestone Centre provides women and their children affected by domestic violence with the skills to lead a life free of violence through full-time counselling and support programs while living in the safety of our program. Women and their children heal from the impact of domestic violence. Dignity and Respect: We believe that all people have value and we treat them with dignity and respect and honour their strengths. Growth and Development: We believe every person has the potential for positive growth and development and we provide the opportunities and supports for these changes to occur. Ethics: We believe that it is important for us to work within established ethical practices while being transparent and accountable. …honouring the voices of women and children.